Facebook Chat Heads Debut on iOS. Is Facebook Home Next? Facebook's nifty chat heads and stickers, which made their first appearance when Facebook announced Home for Android, have made their way to iOS. If you have an iPhone, you can see these fun features for yourself simply by updating your Facebook app. The features came just hours after Bloomberg reported that Facebook is in talks with Apple regarding a version of Home for the iPhone. Could this update be the first of many Home-like features for the iPhone, or will Facebook Home itself debut on iOS? Chat heads make continual chatting while browsing the Facebook app on iOS easier than ever before. Little circles with your Friends' images float on the side of the app, just a touch away. Plus, the chat heads from other open chats will hover above the chat window while chatting, allowing you to easily switch back and forth between friends. 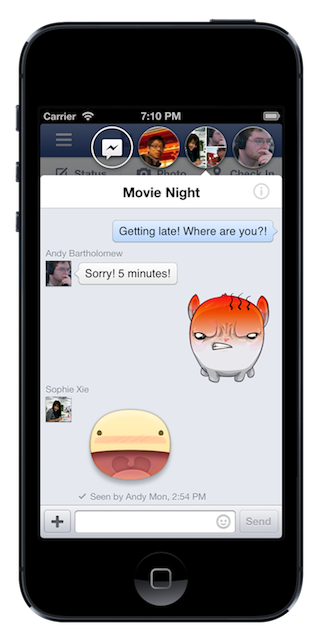 Facebook's stickers emulate emoji-like images seen in other chat apps, like KaokaoTalk. Of course Facebook couldn't resist turning its stickers into another way to make money; it created a store where users can download packs of stickers. Just a few minutes of use with Facebook's chat heads and stickers reveals a new fluid factor that seems like it could be very engaging and even addicting. Though Mark Zuckerberg expressed clear interest in bringing Home to iOS, it is very unlikely. Such integration goes strongly against Apple's product strategy, which keeps software entirely in house. Even so, as Facebook has already illustrated, this roadblock won't keep Facebook from innovating on the iOS platform. "We could also just bring some of the design values to the iOS app. That might be how it ends up. Or we could build just the lock screen," Facebook's director of product, Adam Mosseri, recently explained. "It may or may not be Home." Whether or not Facebook comes to iOS, the company has proved itself to be quick on its feet with these early product feature rollouts on iOS. Facebook investors should rejoice. Any increase in engagement and user experience should make Facebook an even better advertising platform, which is ultimately the fundamental driver of Facebook's stock. The article Facebook Chat Heads Debut on iOS. Is Facebook Home Next? originally appeared on Fool.com. Fool contributor Daniel Sparks has no position in any stocks mentioned. The Motley Fool recommends Apple and Facebook. The Motley Fool owns shares of Apple and Facebook. Try any of our Foolish newsletter services free for 30 days. We Fools may not all hold the same opinions, but we all believe that considering a diverse range of insights makes us better investors. The Motley Fool has a disclosure policy.